Do you want to feed your family nutritious homemade dinners on a more regular basis? 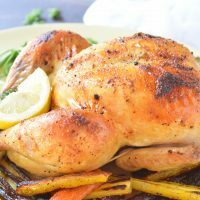 This Zesty Italian Oven Roasted Whole Chicken Recipe requires only 3 ingredients and less than one hour of cook time! 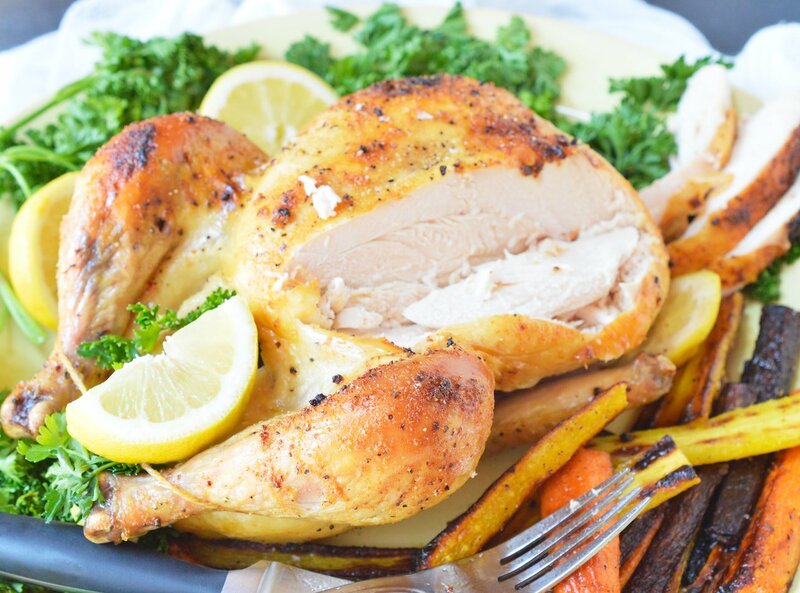 Serve your family a juicy, flavorful whole roasted chicken dinner on a busy weeknight. How crazy is that!?!? I am proud to be partnering with PoultryMate to bring you this tasty recipe! I am not one of those home cooks that buys every kitchen gadget on the market. My cupboards are stocked with the basics and a few specialty items that I find useful. When I learned about the PoultryMate it definitely piqued my interest. 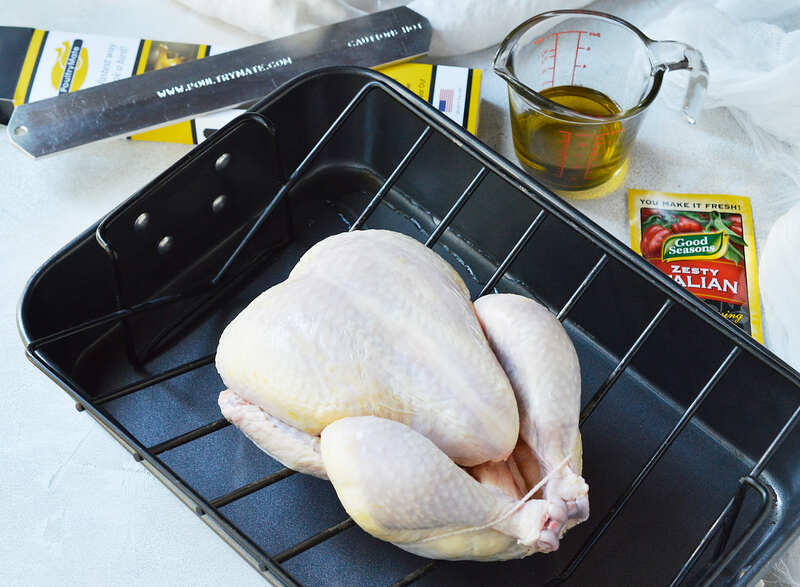 PoultryMate reduces cooking time while keeping the chicken juicy. I absolutely love roasted whole chicken but rarely make it because of the time it takes. Also, if I’m being totally honest, my oven roasted chickens are always on the dry side. 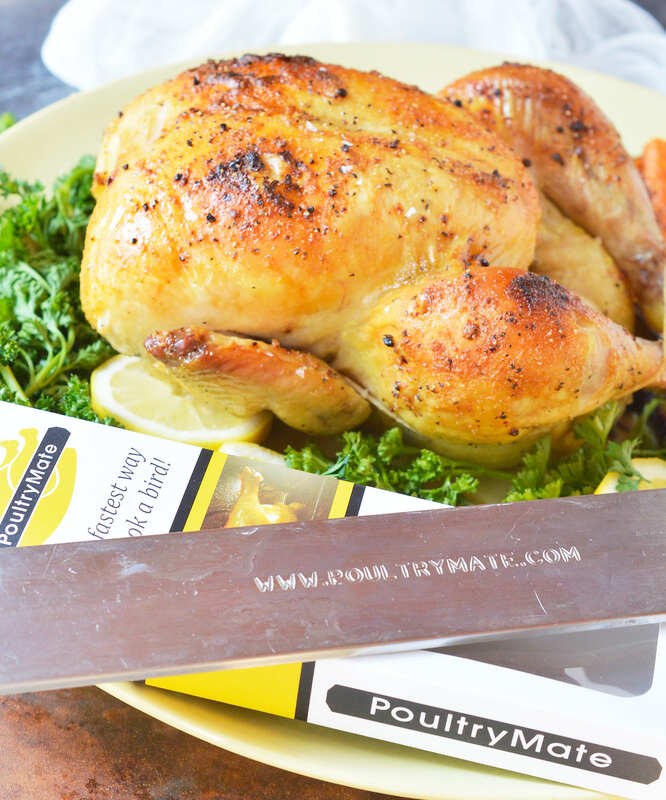 PoultryMate is a conductive metal bar that is inserted into a whole chicken. It heats up in the oven and cooks the chicken from the inside out. As you can see in the video below, the PoultryMate is easy to use and does in fact make the chicken unbelieveably moist. With the PoultryMate you get that gorgeous crisp brown skin and super tender meat. Seriously, I went from dry chickens to chickens that are bursting with juices! 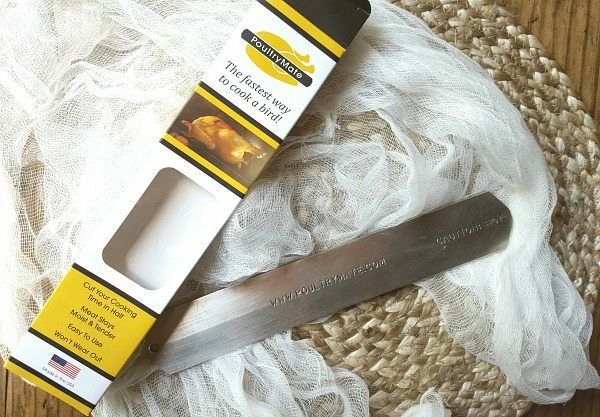 This is a great product for busy families and is a fantastic gift idea for home cooks. Mother’s Day is right around the corner and Father’s Day is coming up soon too. Oh, it is also Made In America! This Oven Roasted Whole Chicken Recipe is about as easy as it gets. 3 ingredients and less than 1 hour to get a nutritious family dinner. Roasting a 4lb chicken without the PoultryMate would usually take about an hour and a half. We are doing it in 50 minutes! The 3 ingredients are chicken (I use a fryer chicken that is trimmed, trussed and ready to go), olive oil and a package of dry Zesty Italian dressing mix. Yes, 3 ingredients and loads of flavor!!! 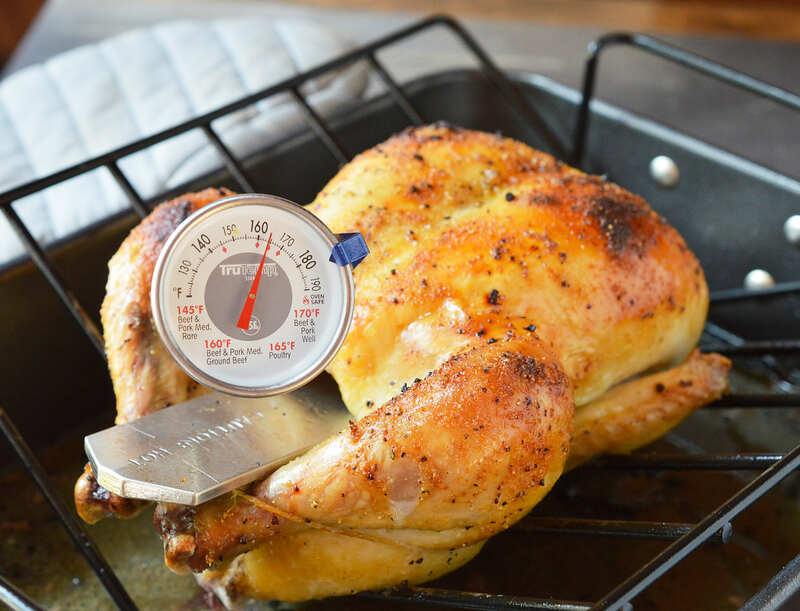 Roast your chicken to the safe internal temp of 165°F. I usually go a little over to 170°F and it still turns out moist. Serve with roasted carrots or your favorite side dish. Here are a few sides that can easily be made while the chicken is roasting: Easy Rice Pilaf, Lemon Garlic Pasta or Brown Butter Mashed Potatoes. Imaging sitting around the family dinner table on a weeknight to enjoy this meal! 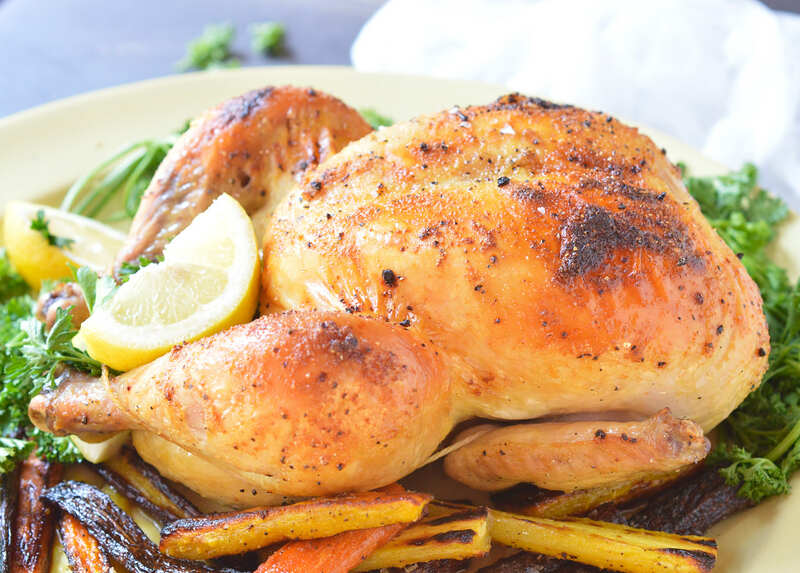 This Zesty Italian Oven Roasted Whole Chicken Recipe requires only 3 ingredients and less than one hour of cook time! 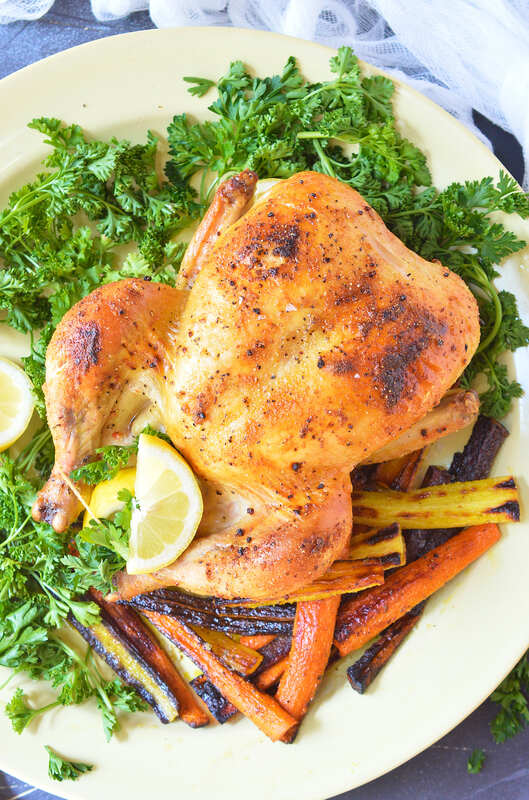 Serve your family a juicy, flavorful whole roasted chicken dinner on a busy weeknight. Remove chicken innards (if necessary), rinse chicken and pat dry with paper towels. Position chicken on a roasting pan fitted with a rack. Generously coat chicken with olive oil. Sprinkle on Zesty Italian mix. (Use approximately 1/2 package for a 4Lb chicken) Insert PoultryMate. Roast chicken at 450°F for 20 minutes. Reduce heat to 375°F and roast 28 minutes. (or 7 minutes per pound) Once internal temp reaches 165°F, remove from oven and let sit 10 minutes before carving. Haha! It happens to the best of us. I’m glad you were still able to enjoy it! 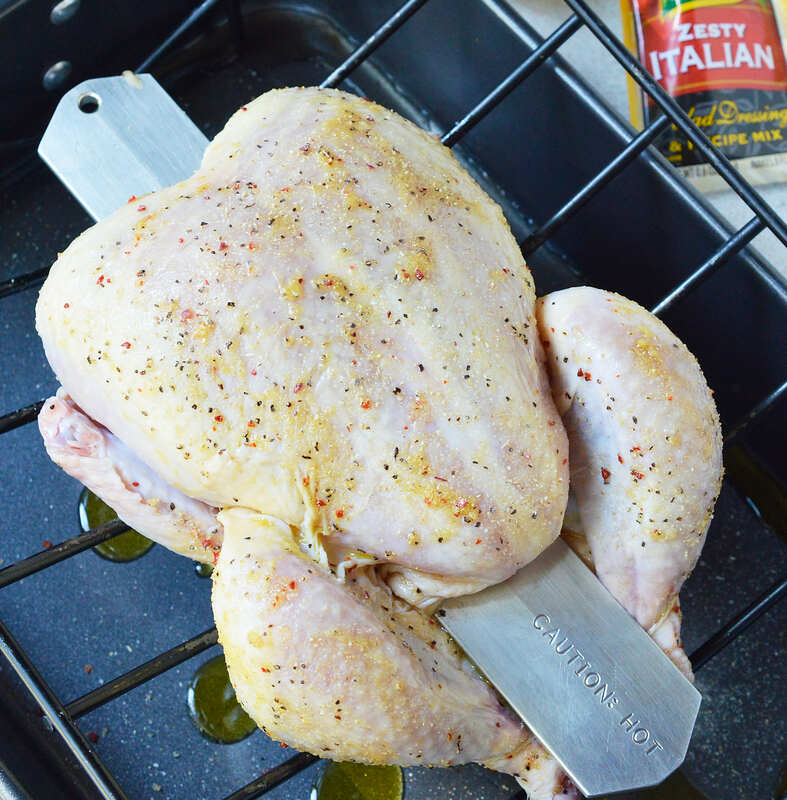 What a great chicken-baking tool! And easy, delicious recipe! I love easy recipes! These looks so fantastic, Nicole! 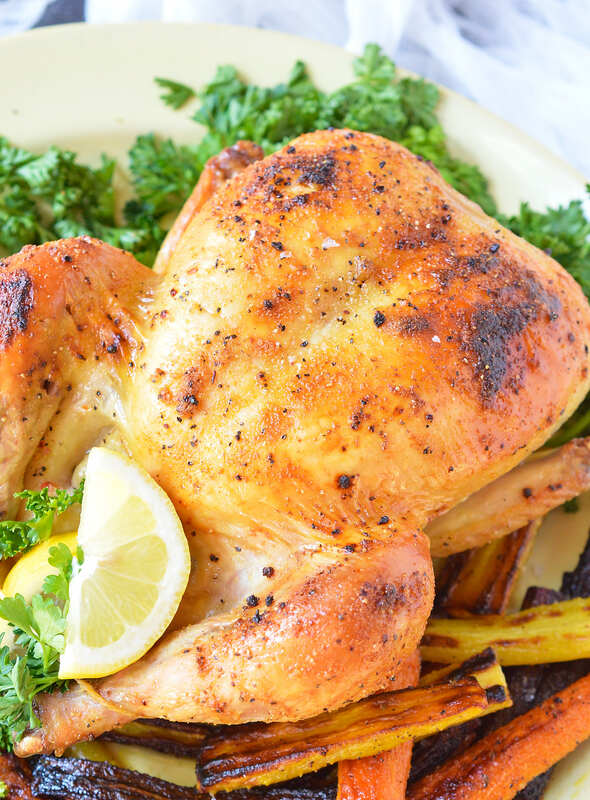 Oven roasted chicken is one of my FAV meals! I need to make this for dinner this week! WAIT! What?! I’ve never heard of such a thing, but now I’m totally obsessed and need to get one for us! I need to start roasting whole chickens every week again! I’m always so glad when I do! Me too! It’s a great way to get 2 meals with minimal effort. Your picture shows roasted vegetables. How did you prepare them with the roasted chicken?